The merger between aspects of nature and utilitarian forms drives me to create. The flowing patterns of a river trapped in time incised into a bowl as a visual and tactile thing excites me. The impression of morel mushrooms carved into a platter thrills me. Having a cup of tea in a mug that draws you out of your kitchen and into nature, to me is what my artwork is all about. Varied texture and patterns are abundant in nature. 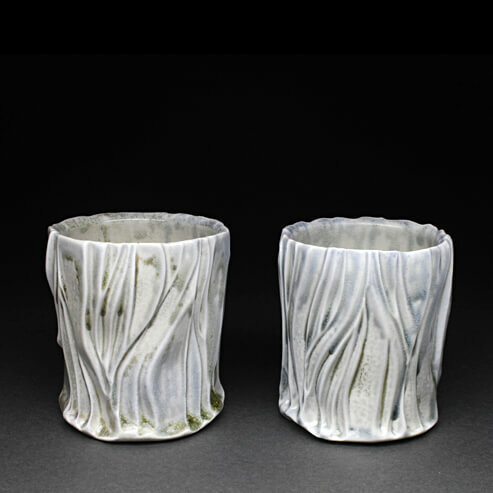 Through passionate and patient study, I strive to add the beauty found in nature to my porcelain carvings. My mind wanders to things such as glistening fish scales and lichen growing on a rock when I carve my pots.